For the roughly 16,000 drivers who drive each day on Highway 93 south of Missoula, you likely know this pioneer’s name from a local landmark. He was one of the earliest area settlers along with Pattee, Higgins, Worden and Woody. 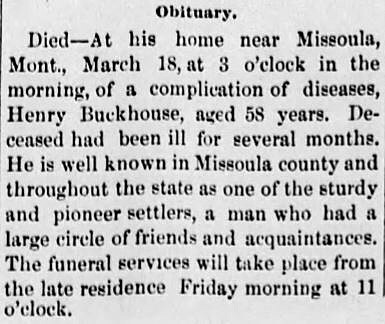 Henry Buckhouse (also spelled, Buckhous), the namesake of the Buckhouse bridge, came to western Montana in the early 1860s. He opened a blacksmith shop at Hell Gate in 1863 to serve the hundreds of men streaming through the area toward the gold fields of Alder Gulch. 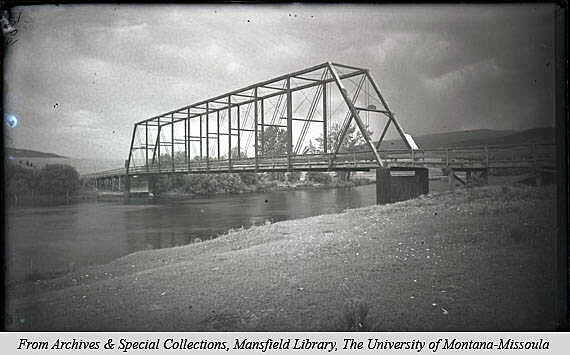 But he became best known as a farmer and one of those promoting the construction of a bridge across the Bitterroot River southwest of Missoula. A building committee, made up of “Messrs. Bass, Edwards and Buckhouse,” quickly collected $2,600 in subscription money, hired John Rankin (Jeannette Rankin’s dad) to do the work, and by late April 1871 opened the “360 feet long and 14 feet wide” structure. It was the first of many iterations of the bridge. Spring flooding always seemed to have a way of dealing with early river-crossing projects. The yearly flood waters also destroyed crops and took lives near the Buckhouse bridge. “Considerable damage is reported among farmers in Missoula county by their crops being washed out and fences carried away by the late floods,” according to the Livingston Enterprise, June 11, 1887. Despite the challenges, the bridge(s) over the river at the Buckhouse Ranch gave farmers a much safer and reliable way to get produce to market. Henry Buckhouse and his wife, Mary Elizabeth, were regular entrants in the Missoula County Fair. They won first place in the 1877 event for “Best Brood Mare,” as well as being honored for their fine corn, barley, squashes and watermelons. Following the funeral held at the Buckhouse ranch, “the remains were followed to the grave by an imposing procession.” Mary Elizabeth Buckhouse died three decades later, May 8, 1922, at age 78. Among their eight surviving children, daughter Gertrude made quite a name for herself as librarian at State University (now UM). 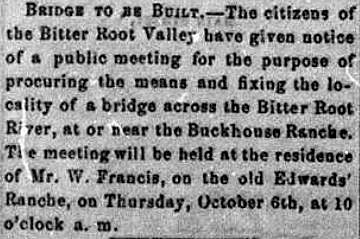 The next time you head out of Missoula toward the Bitterroot Valley, you might give a small nod to pioneers Henry and Mary Elizabeth as you cross the “Buckhouse” bridge. 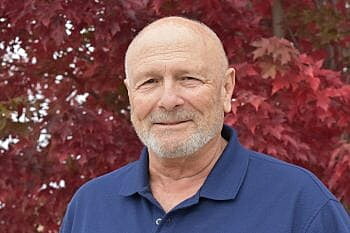 im Harmon is a longtime Missoula news broadcaster, now retired, who writes a weekly history column for Missoula Current. You can contact Jim at harmonshistories@gmail.com.